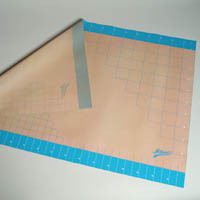 Fondant Workmat 24" X 36"
﻿Non-stick surface for rolling out fondant or gum paste. Easy to read grid allows you to roll out proper size to cover your cake. Measures 36" x 24" x .03" Now thicker and heavier. Will not delaminate, even when put through a sheeter. Made of fiberglass surrounded in 100% food grade silicone. FDA and LMBG approved. Made in China.